I’ve been having a hard time finding graphic memoirs that I truly love. I reviewed Tillie Walden’s Spinning earlier this week, which, while captivating, left me a little cold. 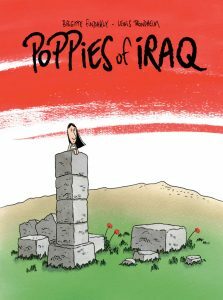 I recently took the plunge on Brigitte Findakly and Lewis Trondheim’s Poppies of Iraq, which was published in English by Canadian publisher Drawn and Quarterly. The book is truly a co-creation between the married French cartoonists. 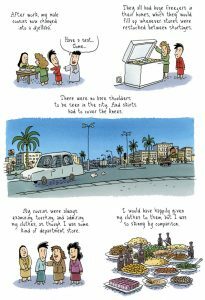 Cowritten by the two authors, illustrated by Trondheim, and colored by Findakly, Poppies of Iraq details Findakly’s childhood in Iraq and subsequent immigration and political exile. The beginning of Poppies of Iraq sets a strong tone; we see Findakly and her family picnic at the ruins of Nimrud, a cultural heritage site of the Assyrian people that was destroyed by ISIS in 2015. 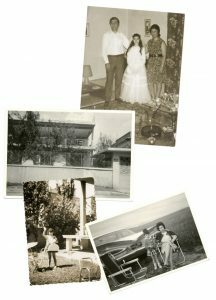 Findakly uses the links between her childhood and the current regional instability to show contrast between that time and now, and tries to do that throughout the book. But from that place of strength, Poppies of Iraq wanders off into the distance. The storytelling of Poppies of Iraq is a bit scattered. 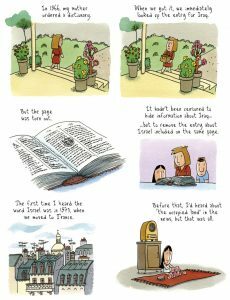 The majority of the comic is a kind of chronological telling that jumps from past to present, interspersed with pictures of Findakly and her family. But interspersed are anecdotes and stories that flesh out Findakly’s home life and the vision of a child in a country trending towards despotism. These stories are some of the best parts of Poppies of Iraq, but they also serve to slow down and disperse the comic’s narrative momentum. Throughout Poppies of Iraq, Trondheim’s spare cartooning dominates. Findakly as a child looks perpetually like a five year old, and other characters are simplistic, almost ragdoll looking. Trondeim is relatively well known for a cartoony style, but this is much more pared down, and I think the book suffers for that. The lines do get more complex as needed, the illustration isn’t always stark and simple, but it’s close. The one part of the book I found that rose above the median was Findakly’s watercolors, which were warm and inviting. Part of the reason I picked up this comic was Findakly’s wonderfully colored cover. There were a few scenes I found remarkable; the most prominent of these, found in “The good memories.” section of the book, which acts like an epilogue to the overall tale, shows Findakly watching a shoe shiner work in the courtyard of her home in Iraq. The sky is beautiful, and the way Findakly colors the trees is quite lovely. Ultimately Poppies of Iraq, while a competent memoir and a quick read, doesn’t leave any lasting impressions. Whether it’s Trondheim’s overly spare illustration, or the book’s fuzzy progression that holds Poppies of Iraq back is hard to say. 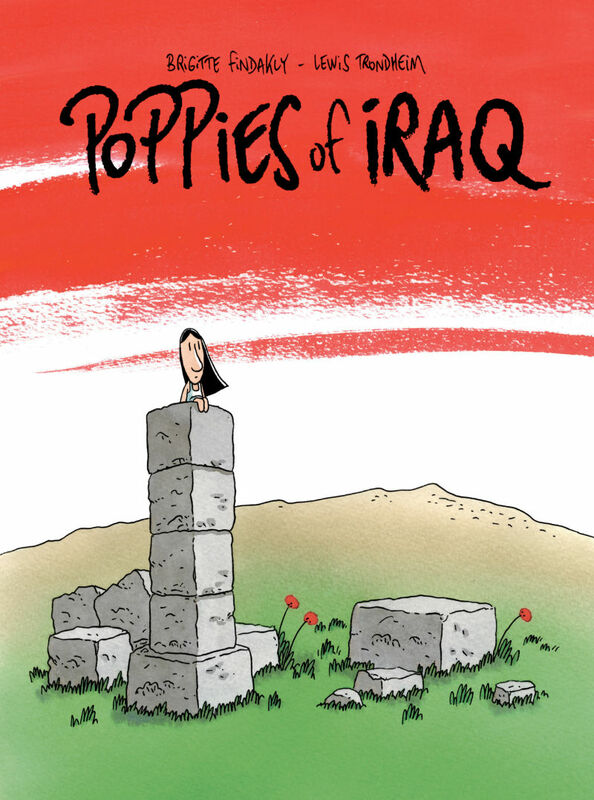 Poppies of Iraq is a serviceable but unremarkable comic. 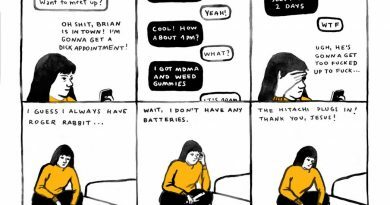 Sequential State is a comics criticism project dedicated to art comics, independently published work, small press comics, and manga. Your support helps improve the site and support the alt-comics community by paying cartoonists for illustrations and other work. If you’d like to support what I’m doing here, please pledge your support at Patreon.